Last February, one of my PPBF picks was Kim Norman’s book, If It’s Snowy and You Know It, Clap Your Paws! Today I have picked another of Kim’s books. Synopsis: (from publisher’s website) Percy the Pug loves puddles—big puddles, small puddles, swamp puddles, stomp puddles. But no puddle is perfect . . . until he finds one with three friendly piglets. But protective Mama Pig says NO PUGS and chases Percy away! 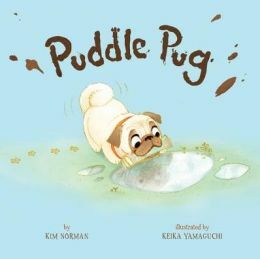 Irresistibly illustrated by Keika Yamaguchi, Kim Norman’s tale about a persistent pug and his pursuit of friendship in puddle paradise brims with warmth and charm. Resources: Make your own puddle map. Label the puddles and use paw print stencil or stamp (found at craft stores) to mark the path from puddle to puddle as you read the story. Draw or name the creatures that Percy encounters at the puddles on his search for the perfect puddle. Talk about why that creature might be in or near a puddle. Why I Like This Book: Percy is adorable! And it’s not just his little pug face! His personality is adorable, too. Adorable and endearing. On top of that, Kim Norman’s language is just plain fun. I couldn’t wait to turn the pages and read her delightful descriptions of the puddles Percy explores. I posted the opening above and that’s just a glimpse at the cuter-than-cute, read aloud fun that awaits. Also, Keika Yamaguchi’s illustrations couldn’t be more perfect! She captures emotion in every spread. And that makes Pug Puddle a perfect marriage between text and art! Susanna Leonard Hill, most magnificent host of Perfect Picture Book Friday, has compiled a categorized list of the books that have been reviewed. It’s an incredible resource for parents and teachers. For me as a writer, it has been a way to build my library list each week. To access the list, click HERE. 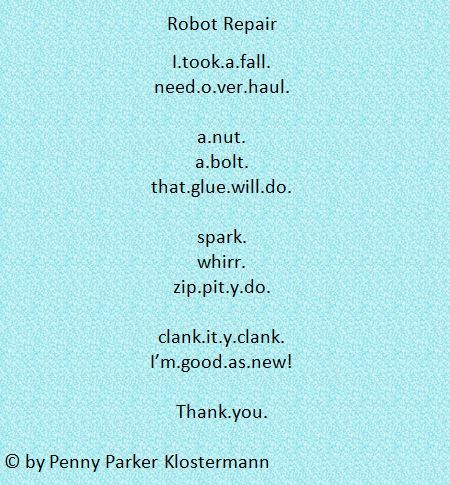 Welcome back to A GREAT Nephew & A GREAT Aunt where I team up with my GREAT nephew, Landon, and we bring our GREAT readers a-picture-with-a-poem sort of thing. Today is Episode 2. 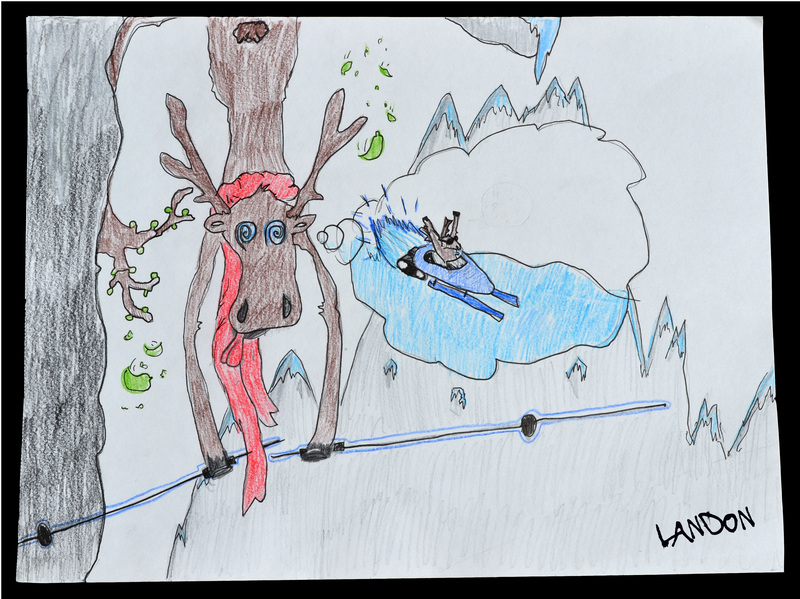 If you missed Episode 1: An Adventuresome Moose, please click HERE to view it. Before presenting our poem and picture for Episode 2, I wanted to highlight Landon’s amazing banner that he created just for the A GREAT Nephew & A GREAT Aunt series. I love his creative vision of our title for many reasons, but this bit of a backstory is a reason that made me laugh out loud. One thing you should know about Landon is that he is highly allergic to fire ants and understandably has a strong dislike for ants in general. So when they tried to take over our series with their drills and dozers, and cranes and coffee, and hammers and hard hats, Landon promptly took the upper foot and squashed their bold move. Ants may rule the hill, but they don’t rule here! Now moving on to . . . 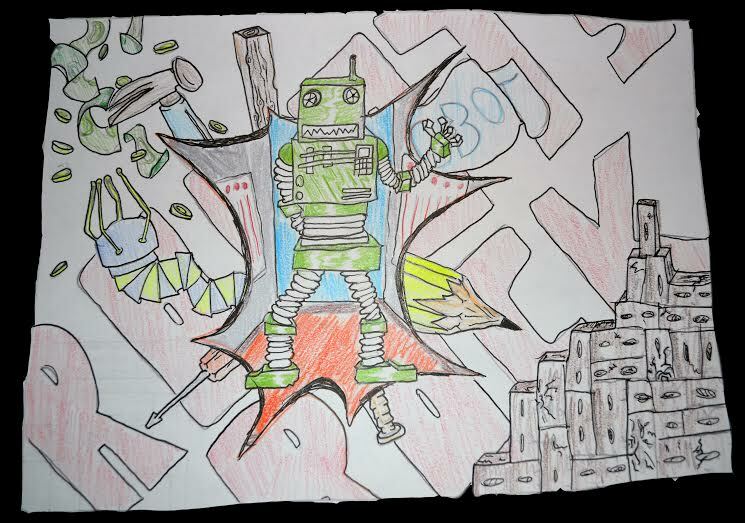 Thanks to Landon, the robot repair was successful! Notice the tools in his drawing. 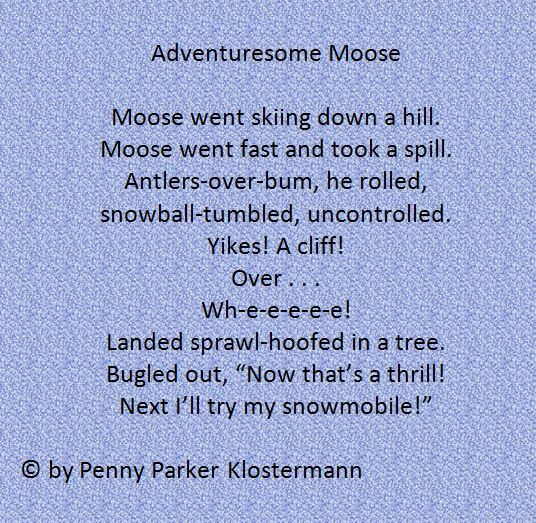 I just love the way he adds details that up the fun of the poem-story! Amy Ludwig VanDerwater is hosting Poetry Friday at The Poem Farm today. Perfect Picture Book Friday is back! Very exciting. A big part of the excitement is being able to introduce books that I have read and that I don’t want anyone to miss. So today I want to tell you about an adorable book for naptime/bedtime. Brief Synopsis: (from School Library Journal) A stuffed bunny cavorting on the endpapers as well as a puppy, bunny in its mouth, standing guard by a bed in the following scene, usher children into this delightful bedtime ritual. Resources: Reading the book encourages parent/child interaction as different body parts are introduced in the bedtime ritual. And HERE are some fun bedtime games. Why I Like This Book: There can never be enough bedtime books and this one is sure to be a favorite. The rhythmic rhyme uses simple language that will have the toddler chiming in with the parent. Didn’t you want to chime in when you read the opening?? The illustrations are a perfect fit. Cozy and delightful! I especially loved the puppy and the bunny being a part of the bedtime ritual. There is no doubt that this is a Perfect Picture Book!